A tour in the middleweight division is likely in the future of Jaime Munguia. For now, he remains entrenched in the super welterweight division as he easily made weight along with mandatory challenger Dennis Hogan ahead of their 154-pound title fight. Munguia (30-0, 26KOs) weighed 154 pounds on the dot for the fourth defense of his super welterweight title which he acquired just 11 months ago. Hogan (28-1-1, 7KOs) also came in right at the 154-pound divisional limit ahead of his first career title fight. Their title fight will stream live Saturday evening on DAZN from Arena Monterrey in Monterrey, Mexico. 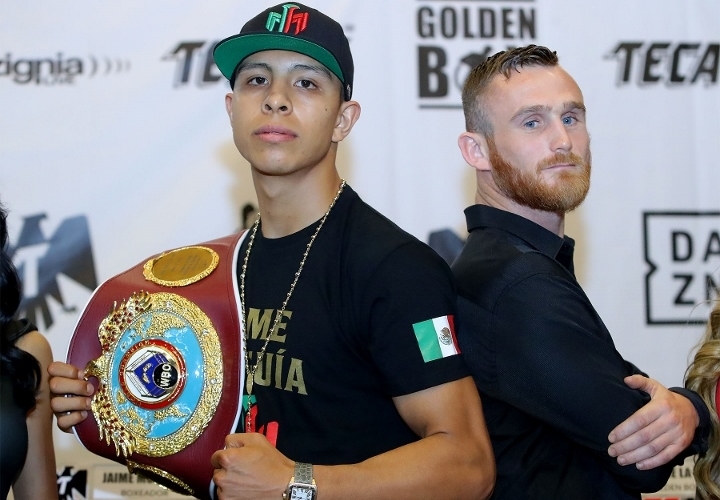 As active as has been Munguia, Saturday’s headliner will mark his first title fight in his native Mexico. Fittingly, the last appearance in his home country for the 22-year old from Tijuana came in his last non-title fight, a 3rd round knockout of Johnny Navarrete last March. From there came a four-fight stretch in the United States, beginning with a one-sided 4th round knockout of Sadam Ali to win the 154-pound title last May. Three successful defenses have followed, having most recently scored a 12-round decision over previously unbeaten Takeshi Inoue this past January in Houston, Texas. Munguia’s name continues to get floated as a future contender in a stacked middleweight division, with most of the division’s biggest names fighting under DAZN banner. Until he gets there, a steady stream of fights will continue with Saturday marking his eighth ring appearance in just 16 months. Hogan’s arrival at the title stage doubles as his first career fight in Mexico. The 34-year old Irish boxer—who now lives and trains in Australia—became mandatory challenger following a 12-round decision over England’s Jimmy Kilrain Kelly last April. He’s fought just once since then, also going the distance in outpointing Jamie Weetch last December. On the undercard, Diego de la Hoya makes his long overdue featherweight debut as he faces countryman Enrique Bernache (24-12, 12KOs). Both boxers weighed in right at the 126-pound limit. Mexico’s de la Hoya—a 1st cousin of Hall-of-Fame former six-division titlist Oscar de la Hoya (who has served as his career-long promoter)—fights for the first time since a 7th round knockout of Jose Salgado last June. He was due to return for a headlining bout in his Mexicali hometown last November, but was hospitalized due to suffering from dehydration after missing weight for the eventually canceled bout. The hope was to get him a hometown showcase ahead of a 122-pound title fight. Instead, the unbeaten contender will now set his sights on the featherweight division. Monterrey’s own Arely Mucino (27-3-2, 10KOs) defends her flyweight title versus Venezuela’s Yarimeth Altuve (10-2), who seeks her third bid at becoming a champ. Both boxers weighed in at the 112-pound flyweight limit. Brazil’s Patrick Teixeira (29-1, 22KOs) and Chihuahua trialhorse Mario Lozano (33-8, 24KOs) both came in right at the 154-pound super welterweight mark for their 10-round battle. Texeira has won three straight—including a decision win over Nathaniel Gallimore last September—since a May ’16 knockout loss to Curtis Stevens in his lone carer defeat.